Yarrow (Achillea millefolium) is a perennial flowering plant from the family Asteraceae. The name “Achillea” is derived from the mythical Greek hero Achilles, who was said to have used yarrow to treat the wounds of his soldiers. As such, the ancient Greeks utilized yarrow as a remedy for bleeding wounds, though they were far from the only culture to recognize the medicinal value of yarrow. 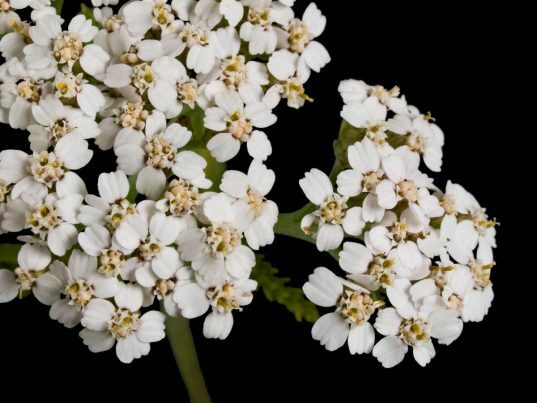 Native Americans turned to yarrow for treating wounds and infections, while Chinese medicine practitioners prized yarrow for its impact on the liver, spleen, and kidney. The reputation of yarrow as a useful medicinal herb continues to this day, and its uses have expanded considerably. Yarrow can serve as a diaphoretic, or a substance that increases perspiration. By cooling down the body, yarrow can provide relief from fever, and can even remove excess toxins and salt to prevent them from accumulating. The antiseptic qualities of yarrow have been known since ancient times, and even today, this herb is being marketed for those same qualities. Yarrow not only promotes quicker wound healing, but it prevents wounds from becoming infected as well. Yarrow is a natural decongestant and expectorant, making it an asset when one has been beset by colds and allergies. Note: Yarrow can be good for the body, but only if you take it in moderation. Too much yarrow can interfere with the body’s ability to absorb essential minerals like iron, as well as induce painful headaches. Yarrow can be good for the heart since it acts as a vasodilator, or a substance that dilates blood vessels. As a result, blood is able to flow easily and blood pressure remains at a steady level. The digestive system can benefit from yarrow too: this herb encourages the secretion of digestive juices and enzymes, both of which are essential for digestion. One of the most common methods of taking yarrow is as a tea. Both dried and fresh yarrow leaves and flowers can be used for tea; either will bring out the bitterness lurking in yarrow. Getting around this is easy, however, as a bit of honey or sweet herbs will make yarrow tea a lot less bitter to the taste. Yarrow is not typically associated with cooking, but it does have culinary uses. It can be used as a tarragon substitute, an addition to vinaigrette, and as a topping on sorbets and ice creams. The reputation of yarrow as a medicinal herb is one that remains strong. Thanks to its abundance of helpful compounds, yarrow is an average anti-inflammatory, diaphoretic, antiseptic, and astringent agent. Moderation is the key to getting the most out of yarrow; too much can interrupt proper mineral absorption and cause headaches.